Scotland Budget Travel, Accommodation, Dining Out, Passes and More! Now some people have to go to Scotland, while others have to go to Scotland.. Whichever group you belong to, those on business, or visiting family or on an unforgettable Scottish vacation experience, saving money is always a good thing! Just because pennies are short for many people at the moment doesn't mean to say Scotland is out of reach. Even if you're on your way to Scotland, or already in Scotland, there are lots of ways the Scots know about, and you should too, to save some money here and there without giving up a thing....nothing wrong with that.... and the Scots are experts! So - starting in Edinburgh and covering travel in and around Edinburgh and the rest of Scotland, in major cities like Glasgow and Inverness, including transport, food, places to stay and visit, I want to give you some useful information for making the money go as far as it can. I am going to let you check out the prices yourself straight from the website as prices change, and I want you to get the most up-to-date information possible. 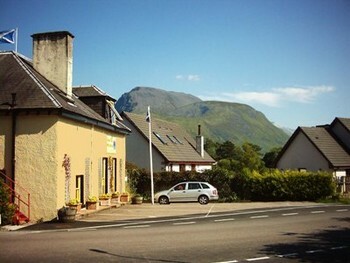 All of these websites can offer you ways to find cheaper tours, tickets, passes, transportation and good accommodation, from hostels to the mountain bothy, whether you're hiking, cycling, walking or travelling on the train or the bus...the best and least expensive ways to see and experience Scotland's magic. First of all - getting there - by bus/coach or by train..both are fun, used by everyone, for good reason. Public transport in Scotland is reliable, clean and efficient. 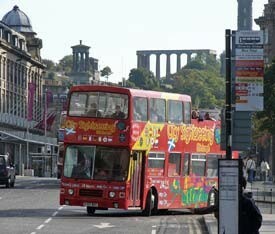 The Scottish roads and city streets were made for sight-seeing buses, and regular buses too. As I said before, in my home town of Dundee, the tram lines are still there, although the trams are gone, but everyone from businesspeople on their way to work, to the "wee wifie" going grocery shopping, uses the bus. They have a regular service, sometimes as often as every ten minutes or so, are on time, (as many people depend on them to get to work), and stop on just about every street corner of cities, towns and villages all over Scotland. For great discounts on bus/coach travel go to Citylink. 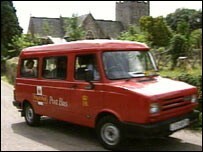 For folks who are more inclined to independent wanderings, there is the unique and quirky Royal Mail Post Bus which carries people as well as letters. You can catch one of these anywhere along its route, two times a day Monday through Friday (except out in the more remote Highlands and Islands) and then they just have one trip a day). All the following companies offer transportation, tours and accommodation, some including entrance fees and some not, which gives you the freedom to choose which places of interest you want to see. You can party in a castle, see Loch Ness,(or even swim in it if you are so inclined!) see the sights, have a fantastic time over Christmas and Hogmanay - and it won't break the bank! Young Person's Railcard. If you are over 25 and what they delicately call a "mature" student you will need an International Student Identity Card and for that you go to International Student Identity Card. 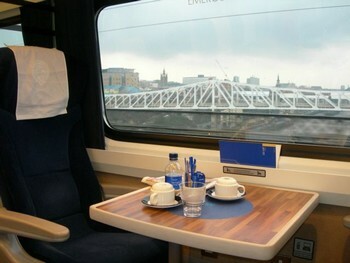 The best deal, if you're travelling all over, is the Scottish Freedom Pass...go to Rail Europe. If you are on your way to Orkney or Shetland, check out Northlink Ferries They give discounts for senior citizens, students and disabled passengers. When you're there - where to stay...? And below another one in Rassay. For hill walkers, climbers or long distance cyclists this website is a must. 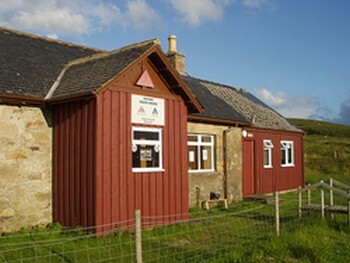 Check out Scottish Camping and for the most extreme camping adventures.. Mountain Bothies (A bothy by the way is a Scottish word for a small hut, cottage or shelter) Bothies are maintained by the Mountain Bothies Association. These are basically weatherproof shelters and are the most basic accommodations of all. Campers and hikers should be self-sufficient for these because they are not furnished nor do they have running water(although there is more than likely a stream or a river nearby) ...you'll need sleeping bags, portable cooking equipment good clothing, boots etc...but what a wonderful experience! Fuel for the fire should be brought, or if fuel stored in the bothy is used, more should be gathered to replace what is used. 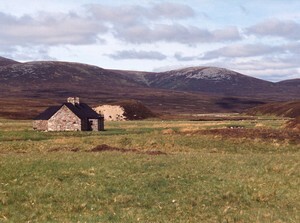 Many bothies are located far from any trees, though peat may provide an alternative fuel. However, peat digging is likely to be discouraged to protect the local landscape and ecology. The fire is to be used for warmth, not cooking, and a stove should be brought. Candles are usually to be found, as with fuel these should be replaced if used. All rubbish (except excrement, which should be buried) should be carried out. When defecating, ensure that a location well away from the bothy and away from any watercourse is used. Did you say you were Cycling? Go to Cycling Hostels Edinburgh for a list of cycle friendly hostels and budget accommodation all over Scotland. Wildlife Scotland gives lots of information about Scotland's rare and exotic birds, fish and animals, including the Atlantic salmon the capercaille, the pine marten, deer, ospreys and a whole lot more. For passes at a discount to castles, historic sites and houses The National Trust for Scotland offers bargain prices for admission to selected places. This is the pass my family always used for our weekly adventures when I was growing up and it's still a wonderful opportunity to see Scotland's magnificent historic castles, houses and monuments at a reduced price. ..check it out at National Trust For Scotland Remember that admission to nearly all museums and art galleries in Scotland is free. Everywhere else in Scotland you can check out Eat Scotland. Finally...one of my favourite and least expensive forms of entertainment..the Ghost Tours! I love these tours..Scotland's capital is spooky at night..it really is! If you come from a country where everything is shiny and new, Edinburgh's wonderful old buildings with their winding staircases, turrets, towers, and casement windows can look like a film set. But they're real enough ..and so, I've been told, are the ghosts! I want you to enjoy these ghost tours of Edinburgh. Explore the underground tunnels, Scotland's hidden history...meet the spirits..and not just in the pub, but out on the streets! !...Old Town Tours is a great place to start. 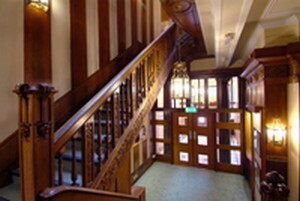 Witchery Tours and Auld Reekie Tours take you to Edinburgh's underground tunnels where you will be introduced to all manner of weird and wonderful happenings in all sorts of spooky places..tales of torture, walled-up people and truly terrifying historical ghost stories from Edinburgh's dark past.... Hold your favourite person's hand..who knows who - or what - you might meet...?! The tours are not expensive, they're a fascinating history lesson, and what's more...they're fun! Just by the way..remember if you're visiting from a non-European Union country, you can claim your V.A.T. (value added tax) back when you leave the country. Shops have signs which read "Tax Free Shopping", usually in the window. If you obtain the form from the retailer and give it to Customs when you are leaving Scotland, you can claim it back (food and books are the exception as they are not subject to VAT).